When I visited the gallery, the room was imbued with a soft autumnal glow, heightening the intimacy of the experience. Altogether there are four sculptures and eleven works on paper exhibited, the most monumental of which is just under forty inches tall. Wilmarth’s view of light grew increasingly dark towards the end, and that darkness is expressed to full effect in the late drawings on paper executed in the final year of his life. 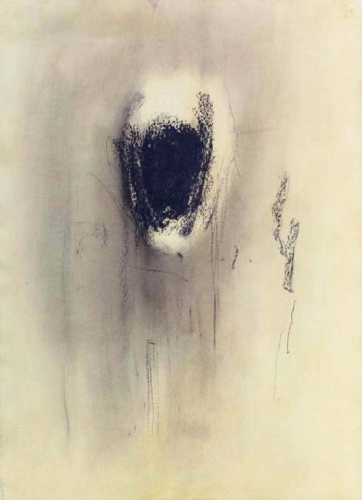 The first work I encountered was one of these intense drawings, “Untitled” (1987), part of a group of highly charged, private self-portraits executed in his final days that Wilmarth had kept hidden away and shown to no one.